I should start off by saying that I’m a huge fan of robot girls. 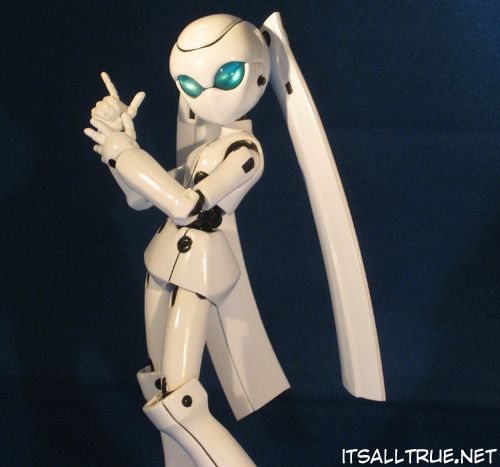 So, Drossel here was right up my alley. She’s the main character in a series of anime CGI shorts called Fireball. The series was created by Disney, but runs exclusively in Japan. It consists of thirteen episodes, each lasting about two minutes. 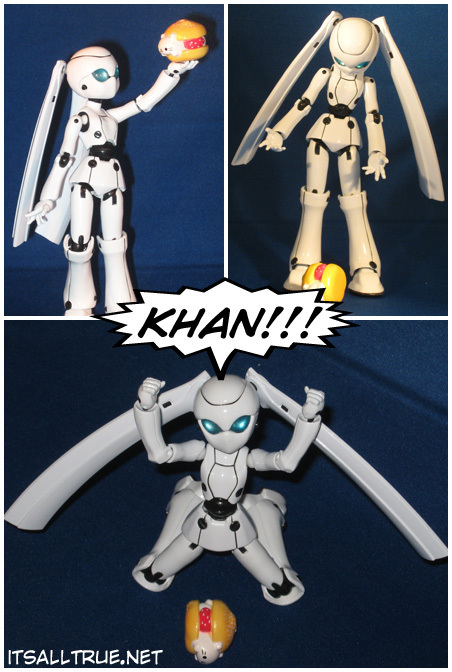 When Drossel came up for pre-order a couple months ago, I jumped on it the first day. If you haven’t heard of Fireball, you can learn more at their wiki page, or view the first episode with English subtitles on YouTube. There is also an official website. It’s in Japanese, but it’s fairly interactive and I was able to make my way around without knowing the language. One of the first details that catches your attention is her eyes. They don’t light up, but they were done well enough to give off the illusion that they do. They have a reflective, almost metallic blue surface on the inside, that even in dim light, makes them look like they glow. Another impressive thing about her is the paint apps. 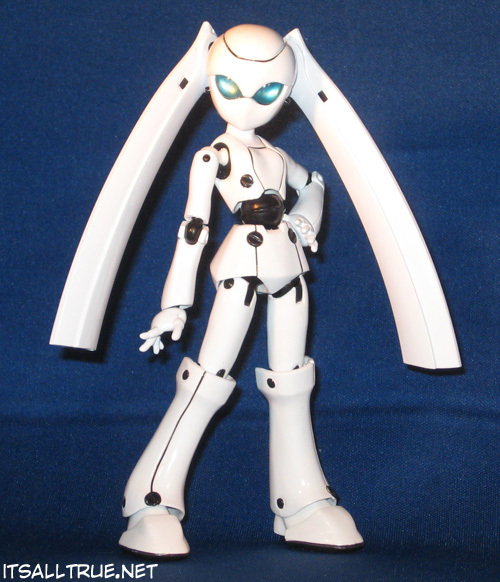 She is molded entirely in glossy white, and all of the black areas and lines on her are painted. All the paintwork is crisp and clean with virtually no noticeable mess. As an added bonus, the printed linework on her extra “hairpieces” is extremely detailed and gives her a very artistic look. The detailing is crisp enough that the right piece says “IRMENGRUPPE HEIZREGISTER” in letters so small, I’m amazed they’re legible. Along with the ornate linework on some pieces, the words JUNO and FLUGEL are also present in crisp detail. All of these paint apps are show accurate and it’s great to see them done so well. 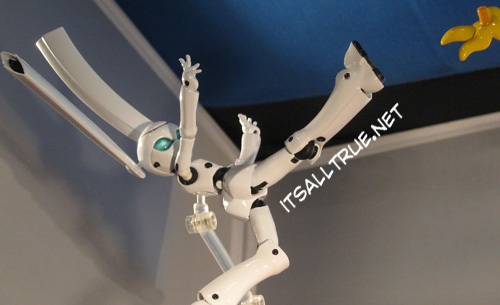 As with all Figmas, which are similar to Revoltechs, Drossel has a wide array of movement. Her neck, shoulders, waist, thigh, and pony tails (yes, each of them are articulated) are all ball joints. Her elbows, hands knees, and feet are hinge joints. Couple all these joints with her wider than normal feet (at least for an anime character), and this gives her the ability to hold most of her poses on her own. 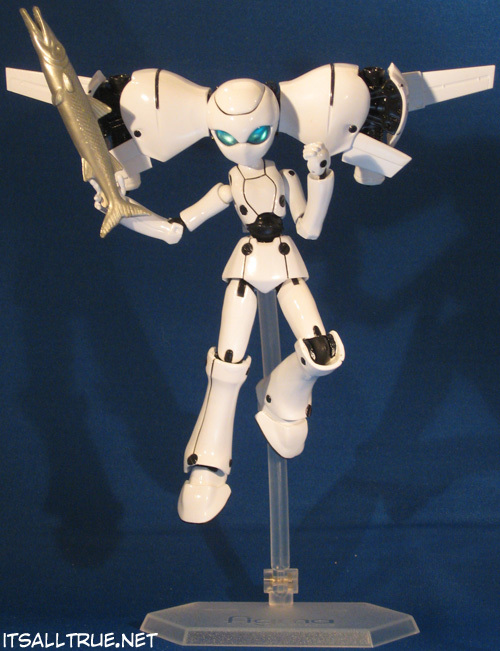 But, just in case you wanted her in a complicated, flying, or even falling pose, she comes with a basic Figma stand. She has a ton of other accessories as well: eight various-posed hands, her “jetpack hair” and the wings/rockets to attach to it, her “capoeira hair” (as seen in the close-up above), and the book her father left for her in the show. Overall, she is a very sturdy piece, but there is one thing to watch out for. There have been reports that her shoulders are sometimes frozen out of the package. I can confirm this because mine was that way. Whatever you do, if her shoulder doesn’t move easily, DO NOT FORCE IT! It will break, and there is no easy or good looking way to fix that specific joint if it breaks. If yours has this problem, place the joint in some boiling water for a couple seconds, and then gently try and move the joint back and forth, don’t force it. Repeat the steps until the joint gives on its own. Then, while it’s still workable, carefully move it around in all the positions so that it won’t harden and get stuck again when it cools down. To me, being a fan of the show and robot girls in general, this purchase was worth it. If you’re looking to pick one up, expect to pay at least $30.00 as of this writing. Most of the online Japanese stores sold out of pre-orders before the month was over. She’s not impossible to find, but you will have to pay a little more than retail for her at this point. That’s it for my first review! Let me know how I did! Does Disney make a lot of content for only other countries? I wasn’t aware they made foreign-only productions. The Batman picture made me laugh. Yes, they do. I learned this a couple years ago when Crossgen Comics went out of business. Disney bought all their characters and licenses to use exclusively overseas. The only one they bothered with in the US was a title called Abadazad. There was also an animated show called W.I.T.C.H that Disney brought over from Italy (if I remember correctly). It was on their Saturday morning lineup for a bit, but didn’t last long. There’s a whole world, literally, of Disney productions that the US never sees. Which is too bad actually, because shows like Fireball and WITCH are pretty good. Those are some pretty amazing paint apps on her hair pieces. Oh, and next time, more pictures. You should have been here… I was clicking and they were setting up and we just kept going… LOL. I most certainly was. I can only imagine how many pictures were taken. @Jason: Just wait till I get the exclusive DVD figure. Then there will be pictures galore. 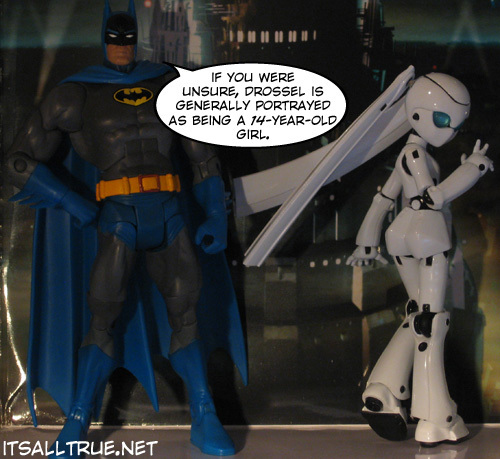 hey, 14 is the age of consent for a robot!!! Hey this great..The pictures are awesome!! Thank you! And thank you for the Twitter folloow! AdventureVault…. 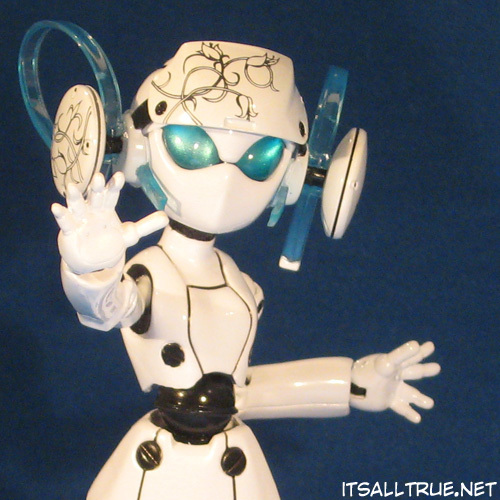 you’re making me want one of these Drossel things!!! !